Want to find out how to raise awareness through the media for a charity or cause? If you want to raise awareness through the media, you’re in the right place. SellUsYourStory.com is part of the UK’s largest press agency. Each day we fill the pages of the major newspapers, websites and magazines. We guarantee to pay you the highest fee for your story, so you can earn money for yourself, or a charity of your choice. Simply fill out the form on this page to tell us the main points of your story. We’ll get back to you straight away if your story sounds suitable for publication. We were contacted by a British woman who has adopted FOUR Tanzanian children she met after volunteering in an orphanage during a holiday aged 19. She is now trying to get them to the UK and wanted to raise awareness of her story. We helped Claire Upshall place her inspirational story as an exclusive in the Mail On Sunday. This was followed up by a spread in Femail Magazine. Claire Upshall was due to spend just seven weeks at an orphanage in 2009. But, after endless nappies, night feeds and cuddles she fell in love with orphan Alfie, then one. Back in the UK, Claire, then 19, couldn’t get him out of her mind and within weeks had quit her job and headed back, caring for 200 orphaned or abandoned children. And over just a 13 month stretch she adopted Alfie and three more children from orphanages – Layla and Isabella, now both eight, and Jack, now five. Single mum Claire, now 28, is now amid a £34,000 battle to get her family to the UK. Unable to find work in Tanzania she has just weeks of savings left, and is crowdfunding to pay for the flights, visas and paperwork to get back to the UK where she’ll get work. Claire from Christchurch, Dorset, said: “When I went out for that first trip it was a dream come true to live and work in the orphanage. Constantly hearing the laughs and cries of the little ones. “I developed a connection with Alfie very early on, but I didn’t for a minute think I would become his mum – that was never the plan. “But I fell in love with the country, the people, the babies and more specifically, that one little boy. “One by one our little family grew and I went from one to four in 13 months. “It’s not what I had in mind when I went out there aged 19, but it just fits and I couldn’t imagine life any differently now. “I always thought it would be important for my children to be in their own culture. I still think their culture is incredibly important. “But I need paid work, and can’t find it. There is a lot to be said about the importance of growing up around your extended family. Claire said when she was a little girl she’d talk about her dream of “looking after the babies” in Africa. She was working as a nanny when she flew to Tanzania on New Year’s Eve 2009 for seven weeks. This was after Googling ‘African baby home’. ‘New kid’ Alfie, then 13-month-old was placed in her arms. She soon made it her personal mission to get the serious little toddler to smile. “I spent a lot of time caring for him and after a couple of weeks he started smiling at me – but only me,” she said. She was in floods of tears when it was time to come home in February 2009. Within weeks she’d quit her job to return for a further five weeks with Alfie and the kids. It helped her make up her mind to come home to the UK and work for a year to fund a longer stretch abroad. After a year as a live-in nanny, she moved back to Tanzania in May 2011, to manage the orphanage, in charge of 20 staff and up to 54 babies at a time. He didn’t speak a word of English and she spoke no Swahili at the time, but they bonded by rolling bouncy balls down the corridors of their new home. Just a couple of months later, in December 2011, two-year-old Layla was welcomed into the family. ‘Girly girl’ Layla could no longer be cared for by her parents, and had met Claire during her first volunteering stint, when she was just five-months-old. Claire would often short-term foster particularly vulnerable and malnourished children from the orphanage, to give them round the clock care. Just three months after her brood grew to two, she was called to pick up a tiny girl from a nearby village, who could no longer be cared for by her parents. Claire was told the 10lb ‘baby’ was five-months-old, but she turned out to be an extremely malnourished two-year-old. Caring Claire took her in full-time to give her the best chance of survival and four months on, in July 2012, Isabella, now eight, was officially handed over to Claire. “She just instantly fit in and was part of the family,” said Claire. 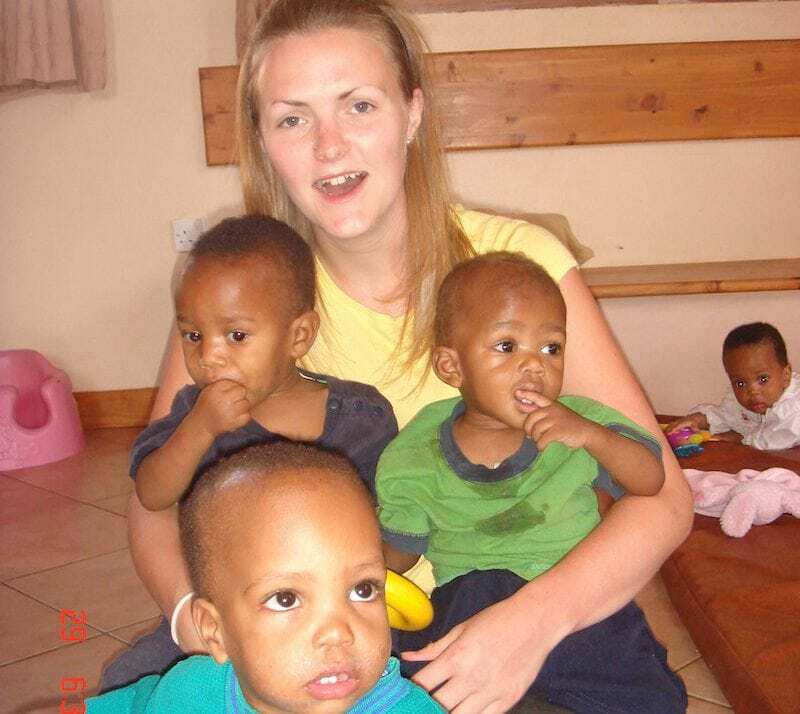 Six months on Claire moved to Arusha, Tanzania, to set up a new baby orphanage in March 2012. She met 4lb abandoned baby Jack, then ten days old, eight months later when she picked him up from hospital. Jack was so small he needed to be woken up to feed, and needed constant warmth, so Claire carried him in a ‘kangaroo’ sling while she worked in the office. Waking up through the night to feed him cemented their bond, and she adopted him eight months later in August 2013. “In 13 months I went from caring for one to caring for four,” she said. “Sometimes when I think about it, I realise it is a bit crazy, but it just fitted and felt right. “Ever since I was a young girl I wanted a big family. With four children to look after, she left the orphange to support her super-sized family. Claire has been searching for paid work ever since. The four children are now thriving at school. Claire is almost fluent in Swahili, but she has found it impossible to find work. She has relied on regular payments from her parents, Helen, 63, a catering worker, and Derek, 65, a retired carpenter. Derek passed away earlier this year. Claire has also returned home for short work stints when money was particularly tight. She has been helped by friends and family back in the UK. She decided to move her family back to the UK in late 2014. Claire has been working through the legal paperwork and ‘red tape’ ever since. So far she has completed the required ‘adoption’ paperwork, obtained their birth certificates and got their passports. But she needs to fund their flights, visas and for final ‘rubber stamping’ legal hearings when she gets back to the UK. She said: “I don’t ask for help very easily – it’s not something that comes to me easily. If you would like to raise awareness through the media for a charity or cause, simply fill out the form on this page. Just tell us the main points of your story. We’ll get back to you straight away if your story sounds suitable for publication. We’ll help you sell an inspirational story, raise awareness or help others in a similar situation. To find out more about the story selling process, see our Sell My Story page. You can find more information about how to use the media to raise awareness here. You’ll also find other ways to contact us here.